Human Germline Modification: A Frontier for Biotechnology, or A Target for Prohibitions? The prospect of human germline modification got a boost in mid-February, with a National Academies for Science and Medicine recommendation that genome editing to preventing genetic diseases in future generations should be permissible. The recommendation came specifically from a panel of experts commissioned by the National Academies, and pointed out genetic situations in which germline modification could be of benefit. Also called heritable gene therapy, germline modification stands apart from standard gene therapy, which targets specific cell types and tissues of people that are already sick. Gene therapy is showing success in certain conditions of retina of the eye, for instance, where a faulty gene causes deficiency of an enzyme, leading to blindness. It is also promising in hemophilia B and in diseases of the hemoglobin protein chains. To penetrate target cells, genetic payload must be carried within particles called vectors. Often the chosen vector is a special virus that has an attraction for the tissue that needs the genetic repair. For treating hemoglobin diseases, a patient’s blood-forming stem cells can be extracted from bone marrow, genetically modified in the lab, then infused back into the patient. For a solid organ such as the eye or brain, the vector with the genetic payload must be injected. For hemophilia, the gene therapy is administered to the liver, but in all these cases only body cells -also called somatic cells- are transformed. 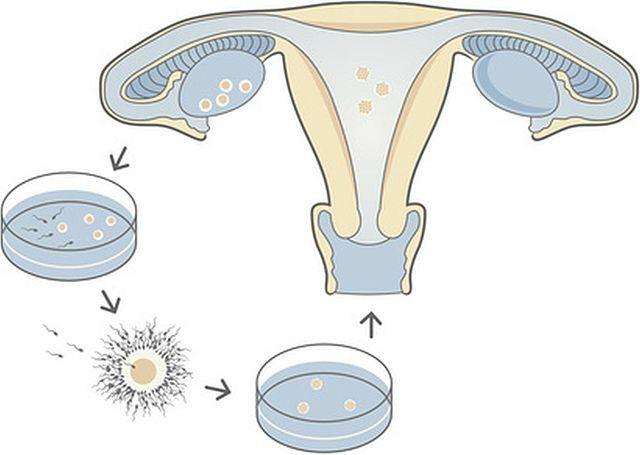 Gametes, or germ cells, meaning sperm and eggs are not modified in the process, so the changes are not passed down. 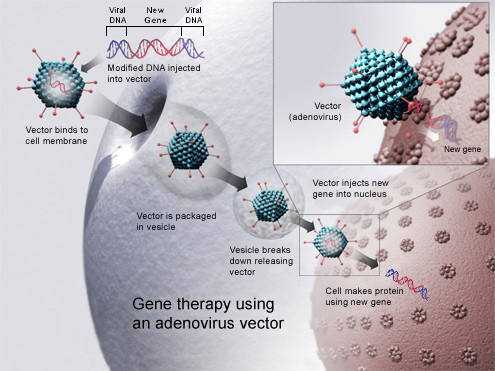 Gene therapy using an Adenovirus vector (© NIH). That’s good for those worried about committing changes to unborn generations, but it’s bad in the sense that it denies future generations preventive treatment. A man with hemophilia B, for instance, could be cured with gene therapy. He now makes the needed enzyme, called Factor IX, because the gene encoding it has been added to his liver cells. However, the rest of his cells, including his gametes, still lack a working copy of that gene. Since the gene is carried on the X chromosome, he can have daughters who are carriers for hemophilia B and they can have hemophiliac sons, even though their grandfather now has blood that clots normally. Another example is cystic fibrosis. This used to be a death sentence during childhood, but affected children are surviving to have children of their own, due to medical treatments and lung transplants, but also gene therapy. As with hemophilia, the gene therapy does not change gametes, so the person still can have descendants with the disease. In the case of cystic fibrosis, the disease can show up in either sons or daughters of the very next generation, so this raises a simple question: Why not do away with the mutation altogether, in other words, do the following? For carriers (people who carry the gene, but are healthy): Edit the genome of the gametes, or use the embryo method described above. Neither group of people would pass down the disease-causing gene. That’s germline modification to eliminate the gene from the population. It may sound like a good idea, but it troubles critics for a few reasons. First, we don’t have the means to do it safely yet. Two years ago, Chinese researchers published results of experiments aimed at using CRISPR gene editing to modify 86 human embryos so as not do have the genotype for beta thalassemia. There was international uproar that human embryos were used for research in the first place, but these had what are called triploid genomes. This means that they had three copies of each chromosome instead of the usual two, so they were not viable. In no way could they have developed into a term pregnancy and they’d have been discarded had they not been donated by the mothers for research, so really the research itself presented no ethical problem issue. What is a problem, on the other hand, is that the genetic modification proved unreliable. 71 embryos survived through the end of the experiment, of which 54 were tested to see whether the CRISPR system had spliced the replacement genetic sequence into the genome. This happened in only 28 of the 54 tested embryos, and worse, some displayed what’s called mosaicism, where some of the cells of an embryo have the original genotype while other cells are modified. Furthermore, some embryos showed off-target effects, where the CRISPR system had modified something other than the gene for beta-globin that was supposed to be modified. The safety issue is a very strong criticism against germline editing of human chromosomes, using current technology, but technology develops rapidly. Overcoming the safety argument will require more advanced genetic engineering, but this does not mean that it must be 100 percent safe. It merely has to be safer than having a baby the natural way, which brings up the reason why people oppose germline editing. While genetic technology has a way to go before it can modify human germline chromosomes reliably and safely, geneticists are extremely advanced when it comes to testing. Two carriers for a genetic disease, such as cystic fibrosis, have a 25 percent chance of producing a child with the disease. This means that if several embryos are created through in vitro fertilization (IVF), only some of them will have the disease. Genetic testing of the embryos could be applied as a screen, and then the couple could decide to have only the normal embryos implanted into the mother’s uterus. The problem comes in if both parents have the disease, and therefore two copies of the disease gene, as in the scenario that we mentioned earlier. You also could have a dominant genetic disease, where having one copy causes the disease but one of the parents happens to have two copies. In these scenarios, the couple cannot make any healthy embryos, but critics of germline modification point out that these situations are very rare. After all, how often do two people with cystic fibrosis start a family together? Finally, there is a concern that allowing germline modification will be a slippery slope, leading to designer babies and a society where the wealthy avail themselves to genetic enhancement. The last point can be debated back and forth and comes down to philosophy, but if safety and reliability do improve, some degree of germline modification may be inevitable, and reasonable. At present, there actually is a kind of germline modification permitted. It’s replacement of a potential mother’s mitochondria with mitochondria from a donor. This produces the “3-parent baby“, because mitochondria have their own genes and come only from your mother. It’s applicable to rare cases in which a want-to-be mother has a mitochondrial disease and cannot produce normal embryos. A new procedure even enables modification of a woman’s own mitochondrial genome, with no need for a donor to become the third parent. It all has risks, but so does having a baby with a mitochondrial deficit. This means that we’re already in a middle ground, so maybe a similar thing should happen when the technology is ready for modifying the genome in the nucleus.